Auckland, NEW ZEALAND. 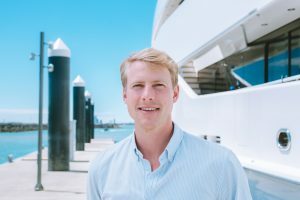 The South Pacific’s leading full service superyacht brokerage and support provider, 37South is delighted to announce the arrival of Ben Osborne as director and stakeholder in the company. Osborne comes on board having acquired a shareholding in the company from co-founder Allan Jouning. Jouning, who set up the company with Phil Tomlinson in 1988, retires his directorship to take a step back and focus on the client side of the business in yacht sales and charter, while Osborne will lead the company in its continued growth. A native New Zealander, Osborne brings with him a passion for the region as well as years of strong business and industry experience. He will work closely alongside director and co-founder Tomlinson to continue to grow the company in the South Pacific, Asia and beyond, solidifying its reputation for professional, personal service as the region’s foremost full service superyacht brokerage and support provider. 37South’s services cover sales, charter and all aspects of large yacht shore support including provisioning, crew placement and project management for refits and new builds. Looking to the future, Osborne is committed to maintaining 37South’s high standards across the various facets of its offerings, as well as its intrinsic values, while helping the business grow into and adapt to emerging markets and demographics. For more information, images and interview requests, please contact the team on service@37southyachts.com or +64 9 302 0178. Founded in 1988 by Phil Tomlinson and Captain Allan Jouning, 37South is a full-service superyacht brokerage and support provider based in Auckland, New Zealand. With a team of seven and decades of combined experience, the company is able to offer bespoke, personal and knowledgable service. Its active charter division is globally recognised as the best in the South Pacific, and it is experienced in all aspects of large yacht shore support including provisioning, crew placement and project management for refits and new builds.